Stochastic interest rate models used to estimate the correct theoretical term structure. What are Equilibrium Term Structure Models? Equilibrium Term Structure Models (also known as Affine Term Structure Models) are stochastic interest rate models used to estimate the correct theoretical term structure. Equilibrium term structure models estimate the stochastic process that describes the dynamics of the yield curveYield CurveThe Yield Curve is a graphical representation of the interest rates on debt for a range of maturities. It shows the yield an investor is expecting to earn if he lends his money for a given period of time. The graph displays the bonds' yield on the vertical axis and the time to maturity across the horizontal axis. (term structure). The models identify mis-pricing in the bond market since the estimated term structure is almost never equal to the actual market Term structure. They primarily look at macroeconomic variables when estimating the stochastic process that can explain variations in the short-term interest rateInterest RateAn interest rate refers to the amount charged by a lender to a borrower for any form of debt given, generally expressed as a percentage of the principal. The asset borrowed can be in the form of cash, large assets such as vehicle or building, or just consumer goods.. They work under the assumption that there is only one unique macroeconomic variable that affects the term structure of interest rates. Although unrealistic, one-factor models provide good approximations of the term structure if the various factors affecting interest rates are highly correlated. They work under the assumption that there are multiple macroeconomic variables that affect the term structure of interest rates. The accuracy of multi-factor models increases as they incorporate more factors. The models are usually very complex and require numerical optimization techniques to solve. The first component on the right-hand side is known as the drift component, and the second component on the right-hand side is known as the volatility component. Different equilibrium models model the components differently. Changes in forward interest rates (relative to the spot rate) are normally distributed. The rate of change of forward interest rates (volatility of forward interest rates) is an increasing function of time and is independent of the current interest rate. For example, the volatility in the 5-year forward interest rate is less than (weakly less, i.e., they may be equal) the volatility in the 10-year forward interest rate. In addition, the volatility in the 5-year forward interest rate and that of the 10-year forward interest rate are independent of the current interest rate. An example of an interest rate model that uses the normal process is the Vasicek Model [dr = (r0 – r)hdt + ϭdW]. Changes in forward interest rates (relative to the spot rate) are normally distributed. The rate of change of forward interest rates (volatility of forward interest rates) is an increasing function of time and is directly proportional to the square root of the current interest rate. An example of an interest rate model that uses the squared normal process is the Cox-Ingersoll-Ross Model [dr = (r0 – r)hdt + ϭ√rdW]. Changes in forward interest rates (relative to the spot rate) are normally distributed. The rate of change of forward interest rates (volatility of forward interest rates) is an increasing function of time and is directly proportional to the current interest rate. An example of an interest rate model that uses the log-noral process is the Black-Derman-Toy Model [dr = (r0 – r)hdt + ϭrdW]. The Black-Derman-Toy Model is a one-factor mean reversion model that was developed by Fischer Black, Emanuel Derman, and Bill Toy. 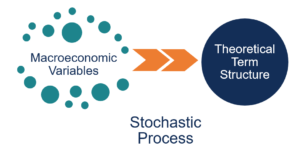 Stochastic OscillatorStochastic OscillatorThe Stochastic Oscillator is an indicator that compares the most recent closing price of a security to the highest and lowest prices during a specified period of time. It gives readings that move back and forth between zero and 100 to provide an indication of the security's momentum.